Utile Plast granules are prepared by heating. UTILE Plast, available from Frozzie Connections , is a non-toxic, biodegradable plastic that can be shaped in minutes, is re-useable and is virtually indestructible. The plastic is available in 30g strips or in 100g granule packs and is easy to use. 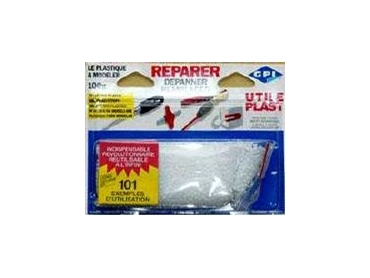 The product is suitable for repairing tool handles or making them more ergonomic. It can also be used to create new tools, repair handles, levers, create screws, bolts. The plastics can be used with wood, metal or other plastics. The Utile Plast granules are prepared by adding them to hot water (above 62°C). When the plastic becomes transparent (white plastic), it is ready to shape. In strips, the Utile Plast is prepared using a lighter. The required amount is heated with a lighter and then shaped according to needs. The only restriction to the plastic is that it should not be used to carry out repairs near heat sources above 62°C, the temperature at which it becomes malleable (e.g. engines). If the repair job has to sit in the sun, white Utile Plast should be used (not recommended for exposure behind windscreens). Strips and granules are available in white, black or grey. The white can be coloured with a commercial dye or painted.